As the start of the new school year inches closer each day here in Florida, my thoughts drift to Back to School shopping for the kids. When I became the mom of four boys, I thought I would miss out on the fun of picking out cute outfits and the newest trendy items that girl moms get so involved in. I quickly learned however, that it could be just as much fun to dress boys once you get into it. That is why I always look forward to our yearly clothing shopping spree! 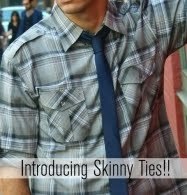 191 Unlimited has some stellar shirts for boys, as well as trendy shirts, tees, shorts, pants and even skinny ties for men. The quality and individuality that 191 Unlimited offers in their clothing is unlike anything I have seen in a retail chain store and that is why I was thrilled when they sent me two shirts for my oldest boys to review! I enjoy the fact that this is a relatively new company and that it came from very humble beginnings, started by two long term friends who banded together and with a little bit of luck and a lot of hard work, were able to carve out a name for themselves. 191 Unlimited was founded in 2002 with $191 and a dream. Long time best friends Parth Sharma and Girish Karnani took $191 to the casino and turned it into enough money to launch their first 191 Unlimited collection. The founders had 4 original principles by which they wanted each shirt to be made: 1) Awesome Fit, 2) Extreme Comfort, 3) Innovative Detailing, and 4) Affordability. 191 Unlimited still employs these 4 core principles in the making of all of its products. My boys were automatically fond of the shirts before they were even fully out of the packaging, whispers of "awesome" and "cool" came from their mouths as I let them try the shirts on. The first thing I noticed was the quality and texture of the clothing. The shirts are not heavy, but they are not flimsy and cheap either. The thread and stitching used it first class and each of the shirts we reviewed had hidden surprises and detailed embroidery as well. The Bad Timing Boys shirt, which is pictured on my son Josh in the far left photo looks like a traditional plaid shirt, but it is far from traditional. There is scrolled embroidery along the length of each sleeve in black and up along the shoulders on the back of the shirt as well. In the center of the shirt on the back, there is a felt/suede like applique that can be seen pictured in the middle photo below. 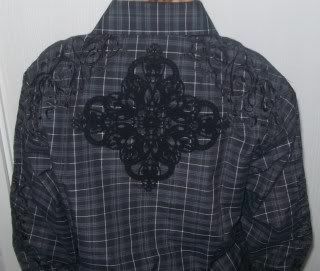 Similar appliques can be found towards the bottom of the front of the shirt too. Even the buttons have detail on them. Overall, that is what I love best about these shirts, they provide individuality and detail without being too busy and gaudy. The perfect mix of casual cool and cutting edge trendy. The second shirt we reviewed was the Smooth Sailing Boys shirt, which is pictured on my son Jordan in the far right photo above. My favorite part of this shirt is the great fabric on the inside of the shirt cuffs and collar. This is a lighter blue than the rest of the shirt, which makes for a real eye catching contrast that is still cohesive with the whole overall look. There are small diamond shapes in white, blue and tan within the lighter blue accents as well. The buttons are square, which is different than most shirts and there is detailed embroidered scroll work on the front and arm of this shirt as with the Bad Timing shirt. If the boys and men in your life are into the latest trends or into having their "own"style, then I would highly recommend 191 Unlimited Clothing. Some styles may be a bit too loud or detailed for some, but even if you like a more understated style, there are many items to choose from on their website that will allow the men in your life to look trendy yet casual. New Arrivals will run you a around $89 for a men's shirt, but there tons of available bargains in the Last Chance section that can allow you to look great on a budget and the quality can't be beat. 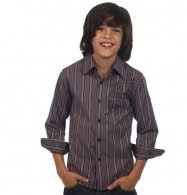 You can purchase all of the items pictured in this review as well as a wide variety of boys' shirts and mens' shirts, tees, pants and shorts on the 191 Unlimited website. 191 Unlimited has graciously offered to give three lucky readers one of their trendy shirts. These would make a great addition to any Back to School wardrobe! Don't have a little boy? No sweat, you can win a men's shirt for the special guy in your life. This giveaway will end on August 2, 2010 at 8pm EST and one winner will be chosen via random.org at that time. The winner will have 48 hours to respond or another winner will be chosen. Open to US residents 18+ only. In order to enter this giveaway, you need be a Google Friend Connect follower and comment here about why you would like to win a 191 Unlimited shirt. No other entries will be counted unless the above mandatory entry is completed. Feel free to do as many or as few of these as you like, but be sure to leave a separate comment for each entry so that it can be counted! If your email is not listed in your blogger profile, please leave one in your first comment so I can contact you if you win. * I was given two shirts for the purpose of review, but was not compensated for this post in any other way. The thoughts, words and opinions stated here are entirely my own and were not influenced by anyone else. I would like to win because I have 3 boys to dress! I would like to win because the shirts are great and like most people money is tight. GFC follower, slblog. I want to win because the shirts are really neat! I'm a follower and I would love to win a 191 shirt for my teenage Grandson. He's growing up and would look so handsome in one. I'm a friend via google connect. DBKaalberg@aol.com and I'd like to win this for my 25 year old son. Hey, he's still a boy to me! 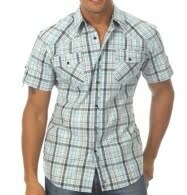 I am new GFC follower and I would like to win because I would like the try this brand of shirts ... I really like the Broken Bottle model. Thanks for hosting this contest. I would like to win so I could give it to my brother who desperately needs NEW clothes. I'd love to see my hubby in the Bad Apple shirt! Ooh Lala! i am a google friend connect follower and i would love to win this because my boyfriend has tons of tee shirts and not many button down's and i think he looks good in a button down! + hes got a birthday coming up! I would love to win because I want to get my brother to stop wearing rags and start having a better sense of style ! I follow. 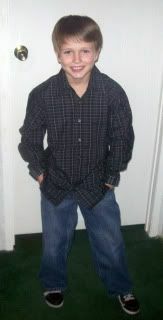 I want to win for my son who is at that age where he wants to dress nicely. 191 Unlimited is right up his alley, style-wise. I follow on google friend connect and I'd like to win because one of the shirts would be perfect for my husband. I would like to win because my son is picky about what clothes her wears but he likes these. Looking over all their clothes I was really pleased to see what they have to offer. I'd love to win a shirt so my guy would look super sharp. LIKE 191 on Facebook (rose manning). I wrote on their wall. I'm a GFC follower and I want to win because these sound like good quality shirts that I'd love to try. I follow you. I would like to win one of these good looking shirts for my son to perk him up. He is going through a rough spot right now. I like you on facebook (Susan Chester). I'd like to win one of these shirts because I find them quite unique. I don't know what it is when it comes to those squiggly designs, but I just love 'em! At 191 I'd pick the Taking Charge for my husband. He really needs new clothes! I would like to win so my son would have something other than T-shirts to wear! Google Friend Connect follower kycouple2000. I'd like a new shirt because, like everyone else, the budget is very strained right now. I follow with GFC and I'd love one of these shirts for my husband because he'd look so good in it! Follower~ Love to win because thses shirts totally ROCK!!! I follow on GFC! I have a boy who needs a stylish new shirt for his birthday!! This would be perfect. My son could really use a nice fashionable shirt for his next set of portraits we have taken professionally.